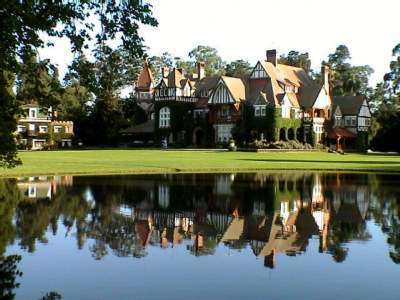 At the turn of the 20th century, Celedonio Pereda built a three-story Norman-Tudor mansion and a guest house on his ranch in Maximo Paz, only 50 km away from Buenos Aires. Here, as many as 30 people can live comfortably with a view to the marvelous 110-acre park and lake. In the main house, two white marble staircases lead to a maze of spacious corridors hung with paintings, and to large, luxurious bedrooms. The ground floor has a spacious sitting room, a dining room with 19th century Spanish antiques and place for 60 guests, a cozy breakfast room and tables in the veranda that provide space for everybody to find his/her own nook. Villa Maria guests can relax by the swimming pool before lunch, stroll under the trees on grounds designed 100 years ago by famous French landscape architect Charles Thays, or play polo next door.